In June 2016 the International Panel of Experts on Sustainable Food Systems released its first thematic report, From Uniformity to Diversity: A paradigm shift from industrial agriculture to diversified agroecological systems. The report advocates the shift from industrial food systems to sustainable food systems. The failure of the industrial food system is presented starkly in the figure below, from page 9 of the report. Failures of the industrial food system. In 2015 4.7 billion suffered from inadequate nutrition, that is 6 out of every 10 people. While other global systems are complicit in this failure, collectively we have failed, given the technology we have, the education systems and the exploitation of cheap energy sources. Today’s food and farming systems have succeeded in supplying large volumes of foods to global markets, but are generating negative outcomes on multiple fronts: wide- spread degradation of land, water and ecosystems; high GHG emissions; biodiversity losses; persistent hunger and micro-nutrient deficiencies alongside the rapid rise of obesity and diet-related diseases; and livelihood stresses for farmers around the world. As someone working at the local level towards sustainable food systems, it is heartening to know that at the global level awareness of the failure of orthodox systems are rising, and there are organisations uniting people from diverse nations to take action. The transformation of our food systems is a place where we can think globally and act locally. Of all of the critical systems that support our economic and social well-being, food is a catalyst for change. The report includes excellent analysis of the eight “lock-ins” that perpetuate the industrial food system. We can erode their influence with the opportunities emerging around the planet. I commend the work of the iPES-FOOD panel. Enjoy their report. 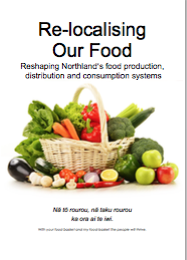 Today Our Food Story, an investigation into Northland’s food system is being published. It surfaces a compelling vision of the benefits accruing from a more connected and local food system. The executive summary from the document is reproduced below. Thank you to my co-researcher Eloise Neeley for her superb work over summer to enable this report to happen. We all eat it, and food has been fundamental to our economies for millennia. This report reveals opportunities to reshape our local food system with strong economic and social benefits. It is difficult to think of another industry as pervasive as the food industry. On the production side, it provides an economic base across our region, rather than being concentrated in Whangarei and Northland’s towns. On the consumption side it feeds whanau, but also patients in health facilities and customers in cafes, restaurants and hotels. We are currently far from optimising the potential of the food system. Food distribution is dominated by corporations who primarily operate here to extract dividends for their shareholders, rather than support a “sticky economy”. Fast Food chains (also here to extract dividends) and supermarkets sell food that is often nutritionally deficient generating a plethora of diet based disease. The average weekly spend of New Zealand households is $61.90 on alcoholic beverages, tobacco and ready to eat foods, but only $22.60 on fruit and vegetables. Shifting this equation even minimally will have positive impacts. This report focuses on food produced for local consumption. It integrates data from desktop research and interviews of 32 people involved in food production, consumption and outlets. It reveals opportunities to improve returns to growers while creating a stronger value proposition for food outlets. There are also exciting opportunities for added value processing. Data from two U.S. locations identify actual and potential new jobs generated by a re-invigorated local food system equating to between 233 and 477 jobs for Northland. The economic benefit of substituting 20% of produce imported into the region with local food sold through local food distributors and outlets, this would equate to additional economic benefits of $27.7 to $55.4 million annually for Northland. The synergies between employment and enterprise generation, social cohesion and the potential to revolutionise positive health outcomes remain largely unexplored in Northland centres. We offer this report as a platform to generate momentum towards a more robust food system. Investigate the feasibility of food hubs in Whangarei and other Northland Centres. Convene a regional discussion on the local food economy.